Shhh. 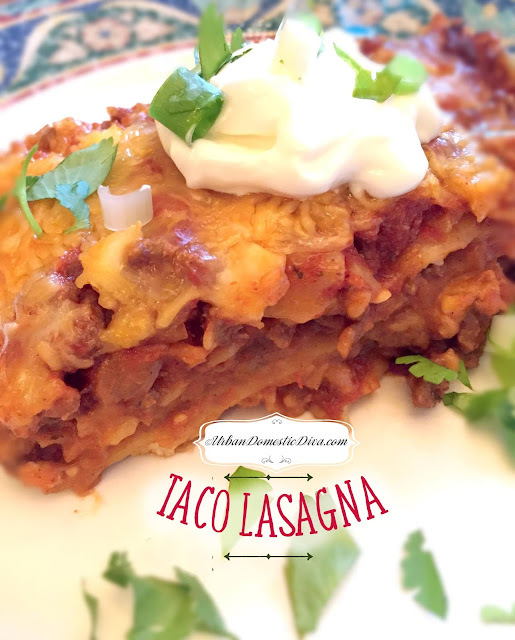 Do not tell my Italian mom or aunts I used the word taco and lasagna together in a post, or in a recipe, or in my kitchen, or that it was hearty and delicious. Preheat oven to 350˚. Spray a 13 x 9 baking dish liberally with cooking spray and set aside. In a large skillet, cook the garlic and onions until tender, then add the beef and taco seasoning. Season with salt and pepper, and cook until beef is browned. Pour in the 20 oz. of crushed tomatoes, water, and salsa, and simmer for a few minutes. Take off the heat. Assemble the lasagna. Ladle a layer of the beef, then lay the lasagna noodles, overlapping them slightly, in an even layer. Don't worry, the moisture of the ingredients will cook the noodles. Layer some of the refried beans. Then ladle the beef, sprinkle the queso fresco and cheeses. Then lay another layer of noodles. Do the layer again, then top with a final layer of noodles. Top with the 8 oz. crushed tomatoes, and any extra cheese you have to top. Cover the pan with foil, and bake for about 45-50 minutes. Uncover, and cook another 10 minutes to brown the top. Let sit for 10 minutes and slice up servings, topping with cilantro and sour cream. Want to spice it up? Add spicey chopped peppers to the onions and garlic. Want to use tortillas instead of noodles? I think you can, but you should cut down your moisture a little bit, and uncover the pan maybe halfway through. The pasta noodles absorb and cook in the moisture. The tortillas may get soggy. Using less liquid and uncovering longer during cooking time could make tortillas a possibility.